The Greenland shark is one of the world’s largest marine species, reaching lengths over six metres. And yet these fish, which prefer the deep, cold waters of the Arctic and North Atlantic oceans, have largely eluded scientific study. Their evasiveness highlights how little we know about Arctic marine ecosystems — and how much we can learn by developing and employing new technologies. For scientists like us, the observation and monitoring of marine species can be challenging under the best of circumstances. But sampling at extreme depths and in seasonally ice-covered waters is especially difficult. 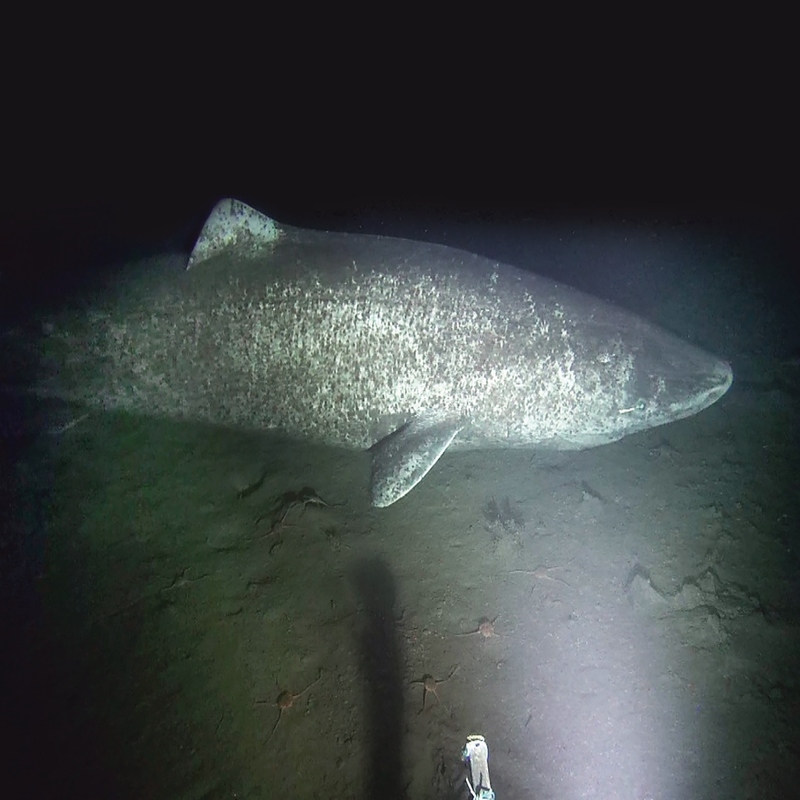 However, we recently captured some of the first underwater video footage of Greenland sharks in the Canadian Arctic. The recordings gave us valuable insight into their abundance, size and behaviour, as well as their distribution in the Canadian Arctic. 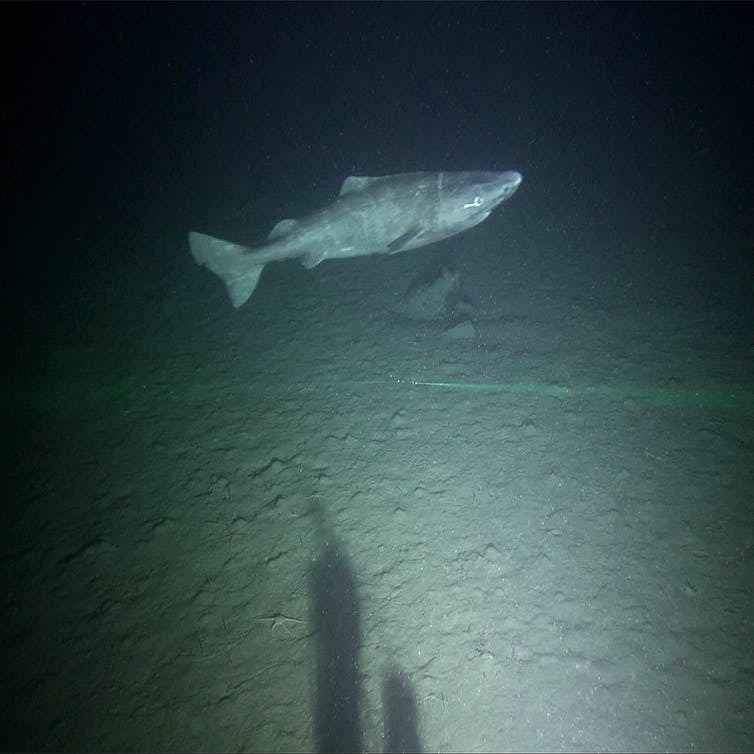 These findings are the first step towards closing a major knowledge gap on the population status of the Greenland shark. And we did it without taking any sharks from the water. Until now, most of what we knew about Greenland sharks came from the historical records of commercial landings. They were fished in the North Atlantic for their oily livers until 1960. A limited harvest still occurs in Greenland, and the species is sometimes encountered as bycatch in fisheries that occur within its geographical range. 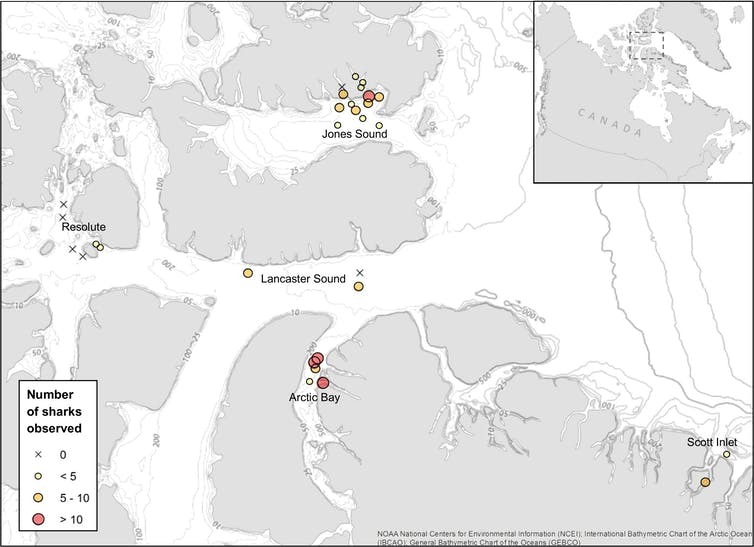 But in areas of the North Atlantic and Arctic where commercial fishing has not historically occurred — such as the waters of the Canadian Arctic Archipelago — their full geographic range has remained unknown. Due to their sluggish and seemingly lethargic behaviour, the Greenland shark is part of the family of “sleeper sharks.” Despite being remarkably slow swimmers and effectively blind, thanks to eye parasites, the Greenland shark is one of the Arctic’s top predators. Although they feed mostly on a diverse buffet of bottom-dwelling fishes, there is some evidence that they can capture live seals. Just how they catch these fast-swimming marine mammals, remains a mystery to researchers. Greenland sharks are by far the largest fish in the Arctic. They rival the Great white shark in length, if not its fear factor. Scientists have also puzzled over their life span and growth rates. They appear to grow extremely slowly — less than one centimetre per year — and are believed to not reach maturity until females are 4.5 metres long and males are three metres long. They also have remarkable lifespans. Scientists recently used radiocarbon dating techniques on the eye lens of a Greenland shark, and found they can live for more than 272 years, making the species the longest living vertebrate on the planet. While these are impressive traits, their age and large size leave Greenland sharks more vulnerable to stressors such as overfishing or habitat loss than other fishes. Scientists know little about Greenland sharks living in the unfished waters of the eastern Canadian Arctic. To help collect information on sharks residing in this region, we baited cameras with squid and dropped them into the deep waters of Nunavut. After two summer field seasons, we had more than 250 hours of high-resolution video recorded from 31 locations. 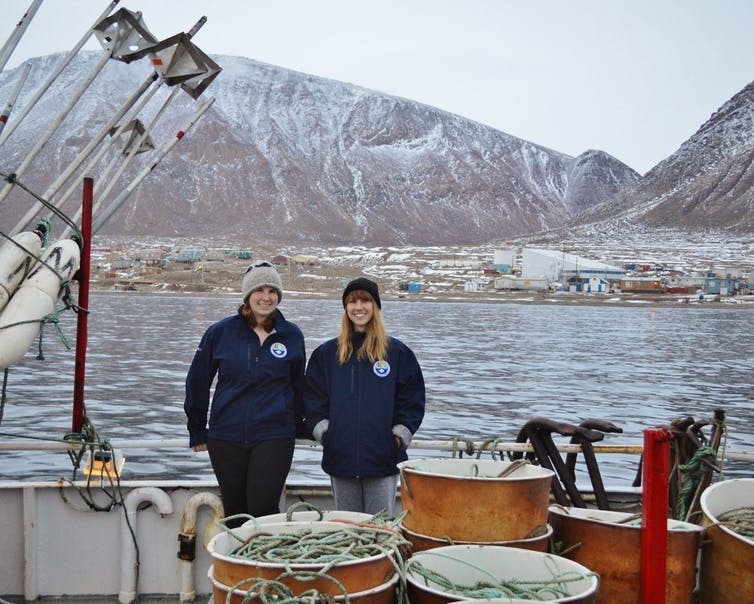 Greenland sharks arrived at 80 per cent of our deployments. We used the video to distinguish one individual from the next based on their unique skin markings, a method researchers also use to identify for whale sharks and great white sharks. Altogether, we identified 142 individual sharks. A large Greenland shark swims up to a baited camera deployment near Arctic Bay, Nunavut in 2015. The videos also gave us additional information about the sharks, including their length and swimming speeds. In some locations, the sharks were relatively small — less than 1.5 metres long — in others, they were over three metres long, but nearly all of them were likely still too young to reproduce. Researchers are increasingly using video to survey marine wildlife. Baited-camera surveys eliminate the adverse effects of scientific longline surveys, where fish are caught on hooks. Even though the sharks are later released, many suffer from the stress of capture or can become entangled in the fishing gear, which can lead to death. We did most of this work within the region of Tallurutiup Imanga (Lancaster Sound), which could become Canada’s largest marine protected area. This area is known as a vital feeding and nursery ground for many Arctic species of both ecological and Inuit cultural significance, including whales, seabirds, polar bears, seals and walruses. Our video data now shows that this area might be important to Greenland sharks too, at least in summer months. In addition, given the significance of top predators in controlling the dynamics of high latitude marine ecosystems, the role of Greenland sharks may represent an important link in Arctic food webs. At a time when oceans are rapidly warming, Arctic sea-ice cover is shrinking and there is increasing interest in Arctic fisheries and conservation, it’s important that we understand the domains of these large, ancient creatures.